Immersive theatre is a relatively new entertainment form - no longer are theatre audiences expected to sit in rows of seats watching action unfold on stage, now they can wander through the performance, sometimes changing the actions themselves. There is an opportunity to explore how technology can play play a part in this new art form. In this talk I will present an immersive theatre production based on the Victorian novella Flatland. The performance ran in pitch darkness - meaning that audiences had to rely on their sense of touch and sound to navigate the piece. I will discuss the design production process, the evaluation techniques and the emerging strategies and experiences that audiences members felt during the show. Sarah is a lecturer of computing at Goldsmiths, University of London. 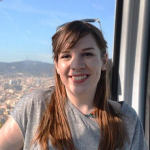 Sarah is the programme convenor for Games Programming BSc and is interested in pervasive and embodied gaming. She teaches a course on Pervasive Gaming and Immersive Theatre, where students are able to create immersive theatre pieces and escape rooms. Sarah researches in the area of HCI, on topics ranging from number entry, to immersive theatre, to emoji.